Location: Torres del Paine, Chile. 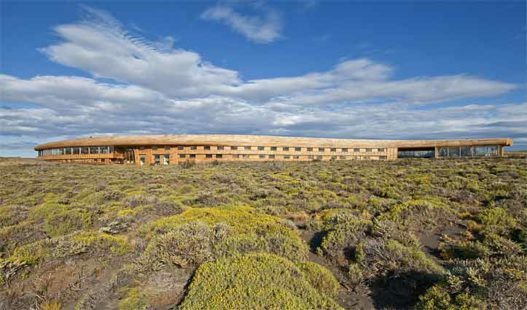 Tierra Patagonia is situated on a bluff where the pampas meets Lake Sarmiento, on the north-eastern edge of Torres del Paine National Park. 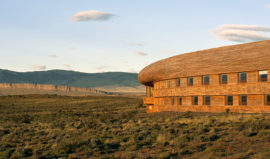 This stunning hotel is almost invisible until you arrive, the award winning contemporary design blending so perfectly with the rugged surroundings in its use of the natural materials of the region. 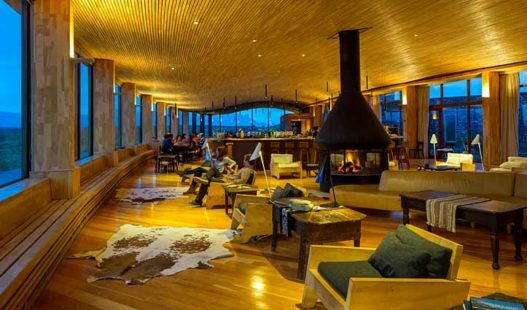 Casually luxurious with lovely public spaces and guestrooms boasting handcrafted furniture and uniquely Patagonian details – and everywhere those incredible big-sky views. Gourmet chefs wine and dine you, and after your excursions into the wilderness, take advantage of the Uma Spa with an indoor swimming pool, an outdoor Jacuzzi, sauna and steam bath. Each day is spent out in the park enjoying uniquely designed excursions for all levels of fitness and tastes to ensure everyone will enjoy the National Park is the perfect way for them. 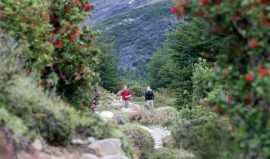 Tierra Patagonia offers excursions for all fitness levels and interests. There is a vast choice depending on your tastes including: walking, hiking, climbing, horse riding, cycling, boat travel and exploration by van. View excursions below. Tierra Patagonia employs passionate local guides with many years of experience and contagious enthusiasm for their surroundings. 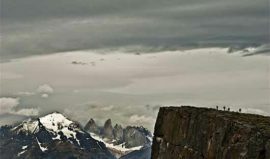 The guides take pride in showing off all Patagonia has to offer. 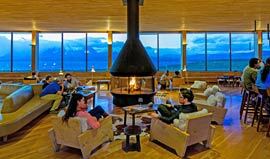 Tierra Patagonia welcome visitors from all over the world who enjoy travel and getting in touch with nature. The many common areas are a perfect for enjoying the company of like-minded travellers and well as the views of Torres del Paine. Tierra Patagonia sources local produce to create delicious meals highlighting local cuisine. This ensures local farmers and fishermen benefit from tourism and your meals are as fresh as they can be. 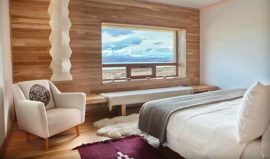 Located in breathtaking surroundings, Tierra Patagonia’s architecture complements the landscape as well as provides a luxurious and comfortable home away from home. Well planed living spaces with generous windows for optimal views makes this the perfect place to retire after a day of exploration. The Standard Rooms offer magnificent views of Torres del Paine and and have a luxurious bathtub in the bedroom. They are 36m2 and the room can be arranged with a king bed or two twin beds. 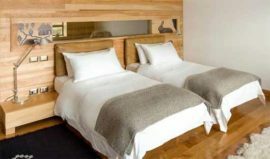 Rooms are equipped with safes, hair dryers and a telephone and styled with hand-crafted furniture, locally sourced textiles and uniquely Patagonian details. The bathroom has a separate shower, toilet and washbasin. The room also includes L’Occitane amenities, a heater, and portable drinking water. Split over two levels, these generously sized suites (51 square meters) feature a cozy living room on the top floor and a large double room with ensuite downstairs. The view is over the lake and the Torres del Paine mountain range. 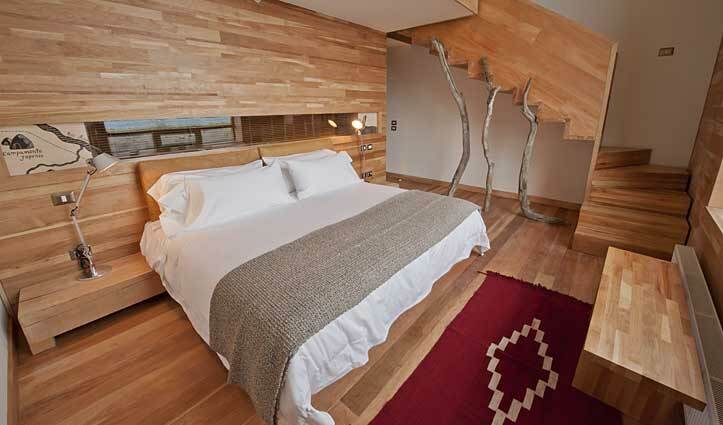 The suites have a safe, hairdryer, telephone and are decorated with hand-crafted furniture, locally sourced textiles and uniquely Patagonian details. 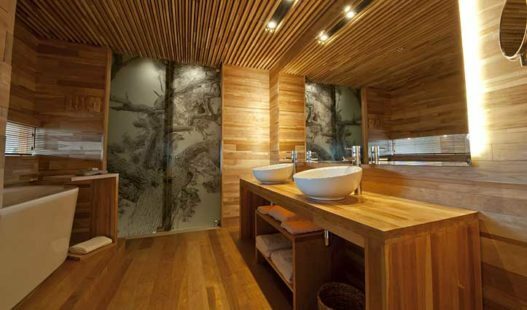 The bathroom has a separate shower, bathtub, toilet and washbasin. The Suite also includes L’Occitane amenities, a heater and portable drinking water. 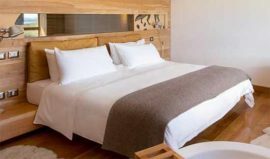 Superior rooms are 36m2 and can be arranged with either a king or two twin beds. 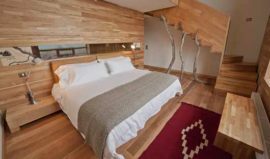 The rooms are equipped with safes, hair dryers, a telephones and decorated with hand-crafted furniture, locally sourced textiles and uniquely Patagonian details. The bathroom has a separate bathtub, shower, toilet and washbasin. Out the window you are spoiled with fantastic views of the lake and the Torres del Paine mountain range. The Superior Room also includes L’Occitane amenities, a heater and portable drinking water. 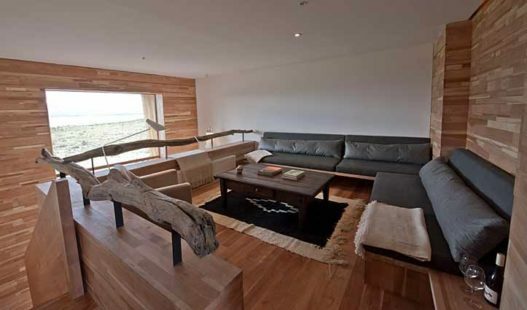 The Family apartments are two interconnected Superior rooms that can sleep up to six people. 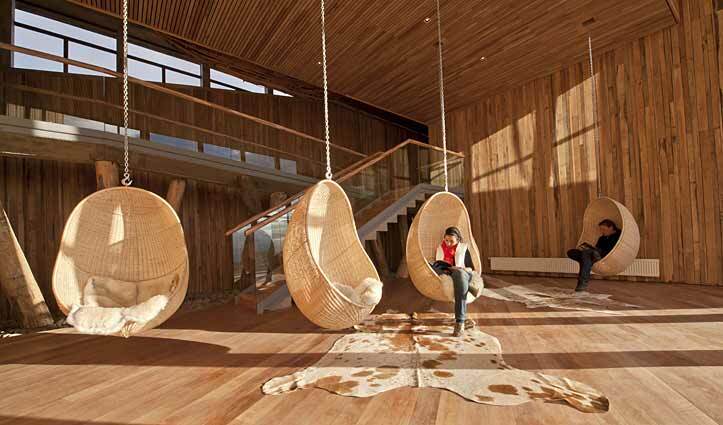 These apartments can be arranged with a variety of bed types, depending on your requirements. These apartments feature two bathrooms as well as amazing views of Torres del Paine mountain range. 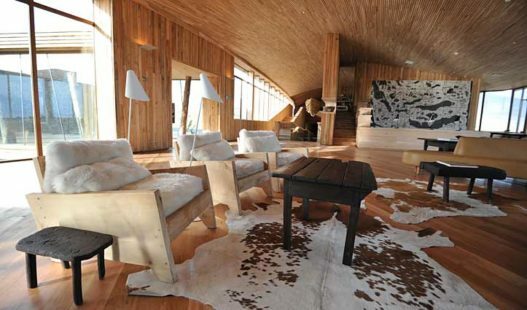 The apartment is equipped with a safe, hair dryer, telephone and is decorated with hand-crafted furniture, locally sourced textiles and uniquely Patagonian details. The bathrooms have a separate bathtub, shower, toilet and washbasins. 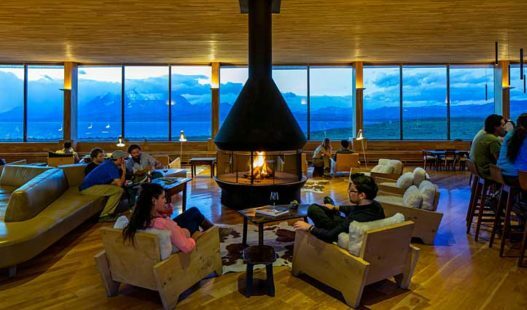 When considering the value of a stay at Tierra Patagonia please note what’s included; not only are all of your meals and drinks included, you also have a wonderful range of excursions to choose from. You can challenge yourself one day and take a more relaxing excursion the next –it’s up to you. 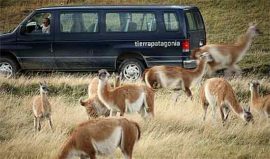 Departing from the hotel by van, pass through some of the most beautiful viewpoints of the National Park before arriving at the Grey Entrance. From here walk into the Pingo Valley on a gently sloping path which follows the bed of the Pingo River. This is one of the greenest areas of the park where you will find interesting geographical formations. Pass by an old “puesto” of the gauchos and reach the “Chorillo del Salmón” a small waterfall hidden in a Nothofagus wood. Return via the same path. 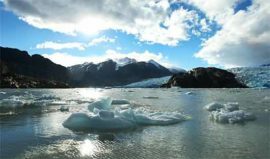 Following lunch, visit picturesque Grey Lake where icebergs carved from Grey Glacier float. This hike starts from the Estancia Lazo. 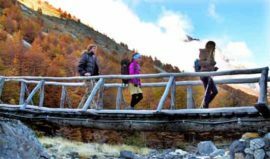 Enter the National Park walking through the Laguna Verde entrance and entering a charming wood of lenga trees. During the hike you can see the Paine Massif and a wide variety of smaller lakes which give wonderful photo opportunities. Share a box lunch surrounded by nature where a variety of different animals can be spotted, depending on the time of the year. A short climb of about 10 minutes will take you to a viewpoint with vistas of Lago del Toro, the largest in the area as well as the Paine River. The descent from here takes 35 minutes to the Weber Bridge where a vehicle is waiting to take you back to the hotel. This is a great option to see most of the national park combined in two hikes. First we will hike the challenging trail to the Ferrier Viewpoint. The terrain is very steep and we gain altitude very quickly (700 meters ascent). We will pass through a beautiful Lenga forest before reaching the windy lookout. At this point we will have spectacular views of Grey Glacier, Paine Massif, Paine river, Lago del Toro, among others. The descent is the same way, very steep!. 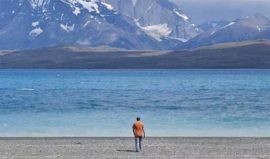 After lunch we will visit the picturesque Lago Grey, where you can see ice floes near the shore and the Grey Glacier can be seen in the distance. This excursion starts with a 30 minute boat ride across Pehoé Lake. 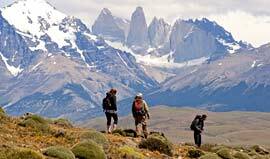 We walk along a winding trail that passes the slopes of Paine Grande and the shores of Lago Skottsberg. There are great views of the Cuernos del Paine on the way. 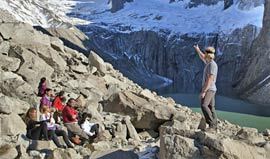 Upon reaching the Italian Camp, we will cross a bridge over the French river and head up the French valley to the view point that sits below the world famous French Glacier. We will return along the same trail and take the boat for the last 30 minutes to the point where the van will take us back to the hotel. challenging and dicult, where the trail winds up thorough a moraine section of loose rock, there is exposure to the wind and where the weather is unpredictable. 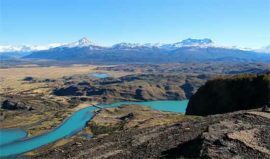 Arriving at the lookout we will have the classic view of the Torres del Paine and weather permitting, we can lunch with this fantastic landscape in front of us. We will descend along the same trail and it takes about four hours to reach the starting point, so it definitely requires good knees and you need to be in good shape. Make sure you dress properly, rain pants and waterproof jacket, hat, gloves, fleece or any warm jacket, synthetic and breathable top, light hiking pants, hiking boots. Avoid wearing cotton, jeans and new boots. This excursion is hard and strenuous if you are not used to long distance hikes. This walk is perfect for stretching your legs on arrival at Tierra Patagonia Hotel & Spa. 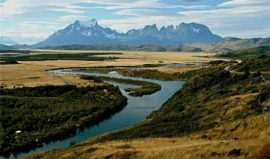 Head towards the lake shore and the boundary of the Torres del Paine National Park; pass through areas of low bush, with panoramic views of Lake Sarmiento. 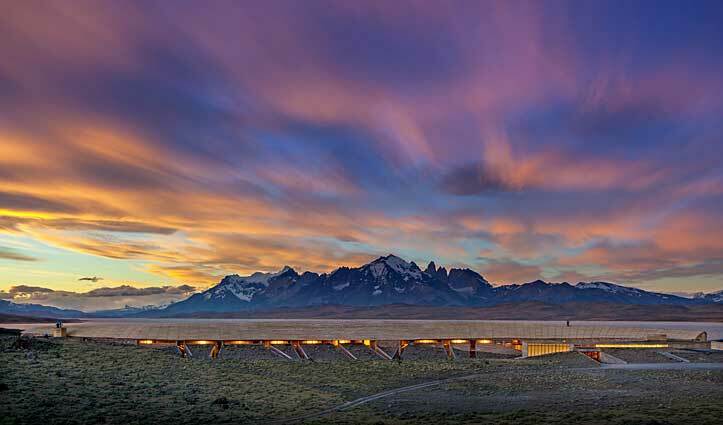 From the surrounds of the hotel, the architecture can be seen to melt into the surrounding pampa whilst the dramatic skyline of the Sierra Baguales behind can be seen, separating Chile from Argentina. The element that most stands out during this walk are the thrombolytes, geographic formations which are several million years old. They were created by some of the oldest living organisms on the face of the earth. The lake shore is full of them and the caves hide the most important predator in the park, the puma. This is the hotel’s garden and it is common to see wildlife such as eagles, condors, guanaco, sheep, foxes and ñandú (a type of ostrich) as well as the amazing view of the Torres del Paine mountain range. This is one of the classic hikes in the heart of the park. After a scenic drive, passing by the Sarmiento and Nordenskjöld viewpoints, we arrive at the starting point. The terrain is fairly flat with only one steeper part, and we can always see the “cuernos” or horns of Paine in front of us. We visit the “Salto Grande” or “Big Waterfall” and continue along the shores of Lake Nordenskjöld. On arrival at the viewpoint, you can appreciate from close up the geology that formed the massif. We return along the same path, with the “horns” at our back. There are frequently strong winds in this area so ensure you wear suitable clothing. Leaving the Hotel we will drive 30 minutes towards the area of the estancias. 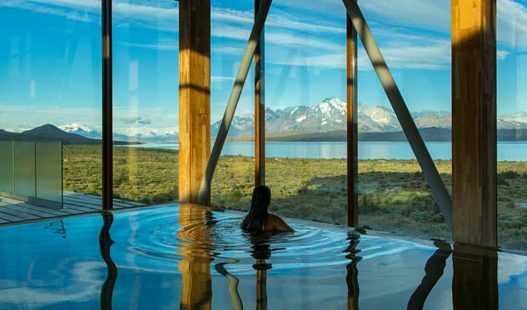 This hike climbs progressively along a prominent rock buttress where we will be rewarded with stunning views of the Torres del Paine, Sierra Contreras, Sierra del Toro and also the Hotel, from a 360° view point. Strong winds are frequent in this area. The descent is down a hill where there is no defined trail, so hikers must find their own way down. This hike is ideal for those who want to see different places outside the park boundaries and away from the crowds. At certain times of the year and depending on weather conditions this may also be a good place to spot condors. Departing from the hotel, we drive towards the Sarmiento entrance to the Park and after 40 minutes approximately, we leave the vehicle to start the walk. The first section is mostly flat then we arrive at a steeper incline leading down to the shores of Lake Sarmiento. Here we can view the incredible rocky formations of the thrombolytes, which take us back to an earlier geological era. With a different perspective of the Paine Massif, we walk by the edges of small lagoons in the glacial moraine spotting wildlife on the way. In springtime the area is full of flowers. 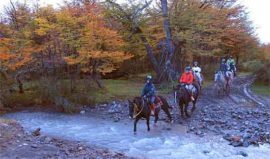 Horseback riding is one of the unique and unforgettable experiences in Patagonia, as much so for beginners as for experienced riders. Most of our rides take place from Cerro Guido. The private land of this estancia or Patagonian Ranch extends more than 100,000 hectares and the local gauchos (cowboys) accompany us on this adventure at “the uttermost ends of the earth.” The horses of the ranch were born and raised in this wild terrain and have been specially trained so anyone may ride here, even if they have no previous experience. 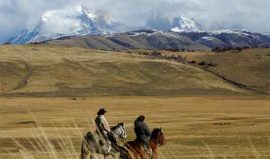 Riding here means you can experience this special part of Patagonia like the locals do, on horseback with them at your side. Half Day Ride. Duration: 2 hours riding. Difficulty: Easy. From the hotel we drive southwards to the Estancia Lazo. It is a scenic drive, with great views of Lake Sarmiento. The ride starts from the Lazo Hosteria and passes through an ancient forest of lenga trees. After an hour or so, we arrive at a lookout point with panoramic views of the Paine Massif. We return through the forest back to the farm, with our gaucho constantly at our side. Laguna Azul. Half day voyage. Difficulty: Easy. Walk length: 30min. From the hotel we head north to the Laguna Azul area and enjoy spectacular views of the North, Central and South towers, weather permitting. Enjoy a short walk along the north shore of the lake and in springtime and summer see many birds in the lenga woods. 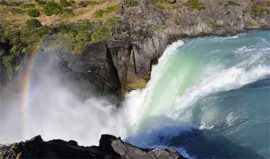 We drive on to see the Paine Waterfall and Laguna Amarga, with beautiful views of the local areas. Salto Grande. Half day voyage. Difficulty: Easy. Walk length: 20min. 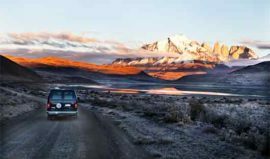 This journey offers a visit to some of the most classic areas of Torres Del Paine National Park. The Sarmiento viewpoint for magnificent views of the Parks largest lake, then on to Laguna Amarga who’s water is four times more salty than the sea. 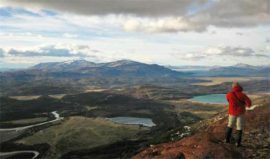 Continue to Nordenskjöld Lookout which is directly opposite the Paine Massif and finish with a short 10 minute walk to the Salto Grande. Return to the hotel by the same route. Paine Massif. Full day voyage. Difficulty: Easy. Walk length: 30min. 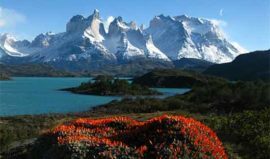 This is a scenic trip which concentrates on the west side of the Torres del Paine National Park. It is the best option to see a large part of the park in just one day, with stops at various places for taking great photographs. 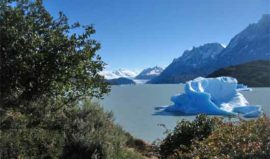 The journey finishes in the area of Lake Grey, where there are glaciers, ice floes and feathery nothofagus woods. If we are lucky, we could see a huemul, native deer in danger of extinction. We will walk for around 30 minutes on the shore of Grey Lake where ice floes from the glacier have become “beached”. The return journey to the hotel is on the south side of Lago del Toro. Paine Massif and sailin gon Grey Lake to Grey Glacier. Full day voyage. Difficulty: Easy. Walk length: 30min, Sailing Length: 3hrs. 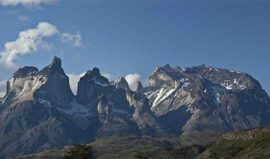 This is a scenic trip which concentrates on the west side of the Torres del Paine National Park. It is the best option to see a large part of the park in just one day, with stops at various places for taking great photographs. The road ends at Lake Grey, where we embark on the Grey II, sailing towards the Grey glacier. 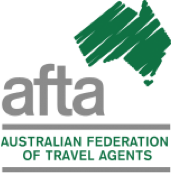 We will see glaciers, ice floes and feathery nothofagus woods. If we are lucky, we could see a huemul, native deer in danger of extinction. The return journey to the hotel is on the road to the south of Lago del Toro. Sailing on the Serrano River. Full day excursion. Difficulty: Easy. Length: 5hr trip in Zodiac and 1hr walk. The trip starts in the Serrano area on the western side of the Park, where you board Zodiac boats to start the descent down the Serrano River. Head into one of the least discovered parts of the area, near the Bernardo O’Higgins National Park, view the Tyndall and Geike glaciers and part of the Great Southern Ice Field. 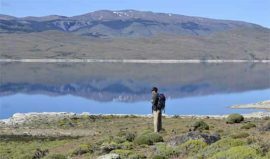 On arrival at the Puerto Toro section, walk for approximately 20 minutes to the base of the Serrano Glacier, viewing coigue, canelo, lenga nirre, chilco murtillo, chaura and calafate bushes as well as other local flora. Return to the Zodiacs and share a Patagonian Lamb Barbecue on the banks of the river. Birdwatching. Half day excursion. Difficulty: Easy. Length: 2hrs walking. With ever-changing landscapes dominated by the Patagonian wind, the Torres del is a meeting point for wildlife. With several different ecosystems, it is possible to encounter more than 120 bird species, including flamingos, caiquenes, ducks, ñandú (a type of ostrich), magallanic woodpeckers, caranchos, eagles and of course the majestic condor. Depart at dawn when the bird life is most active and the light favors photography. Travel between lakes, woods and pampa searching for bird life in an experience which is enriching for both beginners and experts. Discover more about the life cycles of different birds, while viewing the impressive scenery. 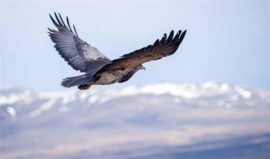 The best time for bird watching is from December to February and the principal areas visited are Laguna de los Juncos, Laguna de los Cisnes and Estancia Cerro Paine. Fly Fishing. Full day excursion. Difficulty: Requires previous experience, this is not a fishing class. Length: 7hrs. 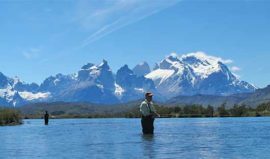 This experience combines fishing the unpredictable waters of Patagonia, trekking to reach unexplored areas, the passion for fly fishing and a world class destination. Accompanied by a local, specialist guide, you will discover pristine rivers and be immersed in local fishing culture. This adventure will put your fishing skills to the test as you fight to dominate the Patagonian wind amidst beautiful scenery. Many rivers in the area are near the sea, so there are several different species of fish. Some places where fishing is available include: Rio Baguales, Las Chinas, Serrano, Lago del Toro and Lago Maravilla, among others. It is possible to find salmon-trout, brown trout, Chinook, pacific salmon, Patagonian tooth fish, and rainbow trout, some of which reach up to 12kgs. During the full day experience, the guide will move according to his “reading” of the river and evaluate the fishing depending on what’s available in the different pools. 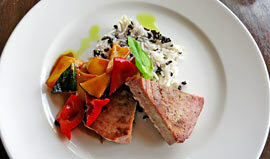 A Patagonian style lunch on the banks of the river is included. Note: Fishing permits must be obtained for each person fishing in compliance with the local fishing rules. 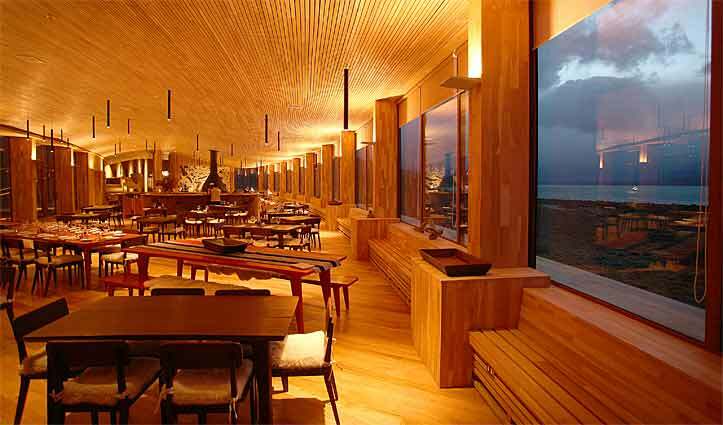 For more information on Tierra Patagonia and to make a booking, call 1300 784 794 or email contact@satc.com.au.